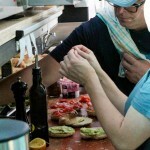 Al Brown spent time as a young chef in the city of Montreal, and while there he developed an enduring love for Montreal bagels. 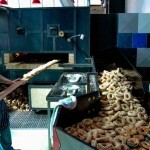 Over there, bagels are consumed with the same reverence and enthusiasm as Vogels is here – they are a well-loved staple. 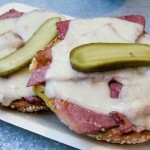 Since then, Al had always wanted to bring those bagels to Auckland, and finally, many years later, Best Ugly was born. 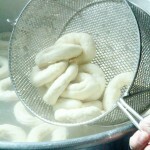 Best Ugly bagels are lighter, sweeter and chewier than any bagels I’ve tried before, that’s because there is no salt in the dough, and they are cooked in water sweetened with honey before being baked in the wood-fire oven. Al had the Best Ugly oven brought over from Canada, he even travelled there himself and spent three months learning the art of bagel-making. 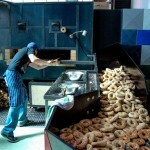 His bagels are called best ugly because they’re all rolled by hand, and each has a distinctive shape – they’re a kind of ugly that comes from doing something the way its meant to be done. 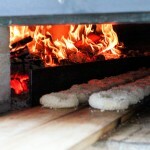 Step into this bagelry and cafe and you’ll see Best Uglys being made right there in front of you; a mountain of dough quickly becomes a pile of imperfect circles which are batch-dunked into a big metal pot, then laid out on long wooden racks that are slowly worked across the length of the woodfire oven. Once they’re golden, they’re sliced, toasted and topped with many good things. The menu is so famous in Auckland now that it rarely changes, although there are monthly specials to keep things fresh (even these are often repeats by popular demand). 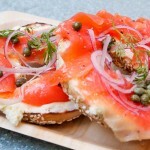 Try the King, a classic salmon lox with cream cheese, capers, dill and thinly sliced red onion, or the Yodi, topped with housemade pastrami (which takes three days to make), swiss cheese, pickle and habanero mustard. If you’re after something simpler, just go with a schmear of Whitestone cream cheese, or better yet, some Koko, an incredible hazelnut spread that’s made on site. Best Ugly is place is simple, authentic and fun. The team yell out your order in cheery sing-song voices, and call to you by name over a loud speaker when your bagel is ready. 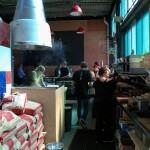 The coffee is Havana, world famous in Wellington, and over the years the quality of it has remained near perfect, even as each talented barista moves on to something new. In winter there is an open fire, in summer there is shade. If it’s too busy to bear, you can grab a six pack of bagels and whatever toppings you like to take home. 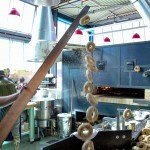 These bagels that began in Montreal are now part of the sassy soul of new Auckland thanks to Al Brown. 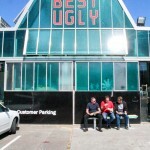 Best Ugly is the first place I want to visit after spending any length of time away, it’s as if I can feel myself reconnecting to the heartbeat of Auckland with each delicious bite.